Zinc hit fresh highs above $3,400 a tonne on Friday, the best level since August 2007 as supply worries intensify and the base metal complex finds support from a robust outlook for global growth. “From the macro point of view, this is not an environment where you’d want to be shorting metals,” Michael Widmer, head of metals research at Bank of America Merrill Lynch, told Bloomberg News from London. Low treatment charges for concentrates, high physical delivery premiums for refined metal and low stockpiles all point to a tight market, Widmer said. LME inventories fell for a 13th week, reaching the lowest level since October 2008. Shanghai exchange stocks have more than halved over the past year. China's zinc and zinc alloy production dropped by 1.5% in 2017 to 4.73 million tonnes due to low processing fees, inadequate concentrate supply and the impact of strict environmental inspections, Beijing research house Antaike said on Friday. Market is "confused" about post-winter consumption outlook in China but historically low zinc concentrate and ingot inventories are set to support prices Antaike told Reuters. China's 2018 zinc output seen rising as more smelters come on stream, with Baiyin Nonferrous Group having already launched new capacity in the fourth quarter of last year according to the report. The metal has more than doubled since hitting multi-year lows in January 2016 when top producer Glencore curtailed production to shore up prices. In December, Glencore said it would restart its Lady Loretta mine in the first half of this year, but added that it still expects zinc output to decrease slightly in 2018 to a shade under 1.1 million tonnes. In 2019, Glencore sees its zinc output creeping back up to 1.16 million tonnes. Overall global zinc supply is to increase next year with the addition of capacity coming online in Australia (MMG's Dugald River project) and South Africa (Vedanta's Gamsberg mine). Today's price for zinc, used mainly to galvanize steel, compares to an all-time high of $4,580 struck in November 2006. 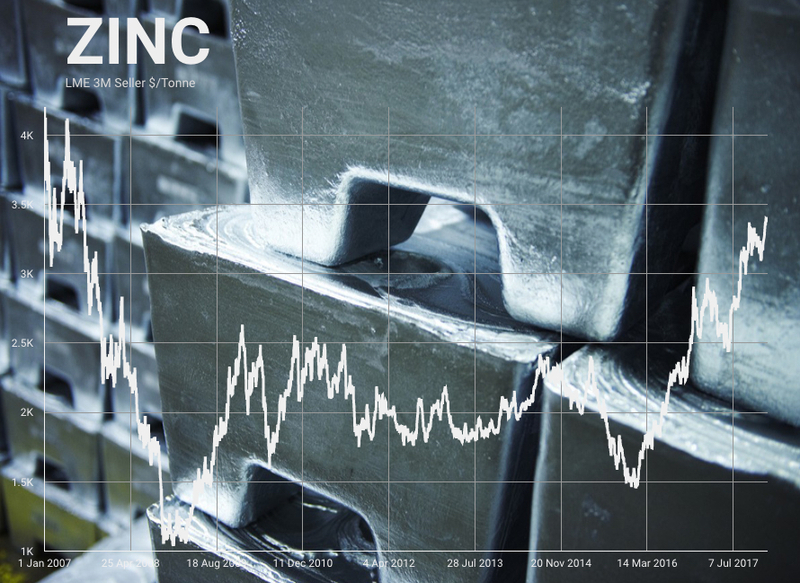 During the depth of the global financial crisis zinc came close to falling into triple digits.